Pics That Pop is an assortment of one-of-a-kind graphics and design resources. Featured are more than 200 cartoon background images from the old Popeye cartoons. Popeye cartoons are in the public domain and I scoured dozens of Popeye cartoons searching for the best scenes to use as backgrounds. I extracted each background by hand and enhanced them in Photoshop to increase the the quality of the images as much as possible. Also included is more than 130 images of animals. Animals are great for grabbing attention and triggering positive emotions in people. These images are also public domain. I took each image and removed the backgrounds and made them transparent so they can be easily added over videos and graphics. There's also a collection of images of signs. I removed any extra text or clutter to make them as easy as possible for your folks to add their own text. Open License Fonts - I assembled a vast collection of over 400 "open license" fonts, which means they come with a very liberal usage license so your customers can use them legally in all of their own projects, plus their customers' projects as well. 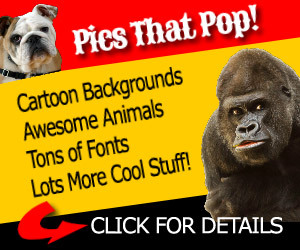 Pics That Pop is part of a JVZoo sales funnel with over a dozen other products. This means if you're approved for just one of my products, you are automatically approved to sell all of them. This page lists all the products in the same funnel. Note: Being in the same funnel doesn't mean there's a dozen upsells and downsells. 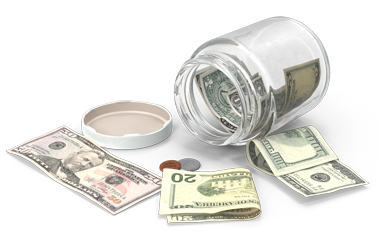 It just means that you only need to sign up for one to be an affiliate for them all. It also means if you send traffic to just one of the sales pages, your cookie will be used for the others. Here's a totally one-of-a-kind collection of images and fonts that will give your video and graphics projects a cool new look. There's over 200 really special cartoon backgrounds. These background images were taken from old Popeye cartoons which happen to be in the public domain. They were extracted from the cartoons and foreground objects removed and then enhanced in Photoshop to make them look as good as possible. If you have any mascot or cartoon characters, these backgrounds will really bring them to life. 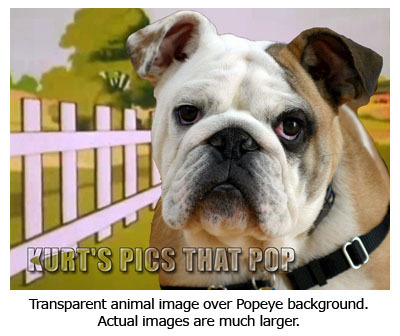 Also included are more than 130 images of animals, all on transparent backgrounds so you can add them over any background image you want, maybe even the Popeye backgrounds. Images of animals are great to use in your videos and other projects, like Facebook posts and adds. Animals really grab attention and they trigger emotions of feeling good in people that see them. This is why so many big companies use animals as mascots. Plus you're getting over 70 images of signs you can easily customize with your own messages. These pictures were modified to make them as easy as possible for you to add your own text. Also included in your download package is a huge collection of high-quality "Open License" fonts. This means you can use these fonts in all of your projects legally. It's better to be safe than sorry. Plus, they've all be organized to save you lots of time and hassle from having to download and install them one at a time. Having a great collection of fonts is a tremendous advantage to video makers and designers. An interesting font is an easy and effective way to make your projects look great and give them that extra "touch". This is truly one of the best and most unique collection of video and graphics design resources you''ll ever find. Check them all out here and see for yourself. PS. Pics That Pop are truly an excellent value and a "must have" for designers that what to take their projects to another level. I'm not sure if the price will be this low, or even if they'll be available in the future.